What Do We Really Understand About Planetary Formation? First of all, we need to imagine the early disk environment around a newly born star. 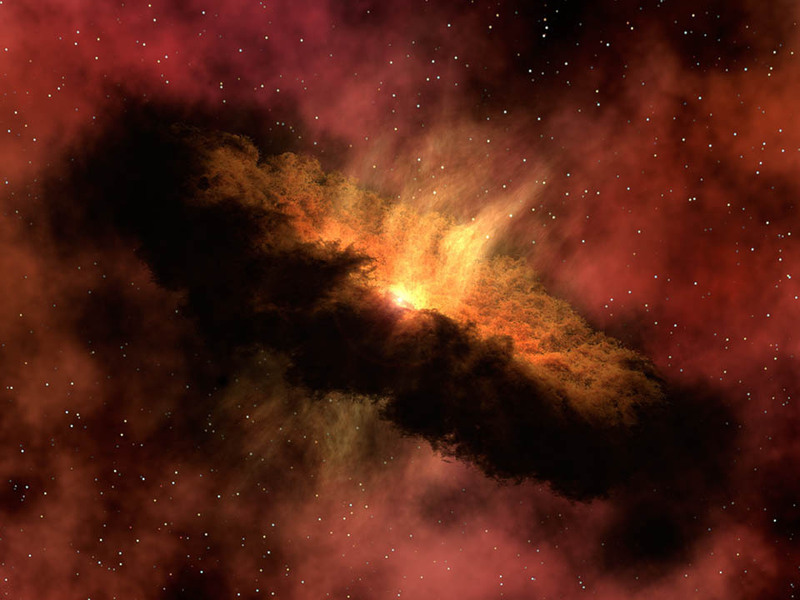 The protoplanetary disk contains lots of dust and gas left over from the initial collapse of the interstellar cloud from which the star forms. Both the star and the disk rotate about a common centre of gravity, and it is the rotating debris, ranging in size from an angstrom up to a centimetre, that can evolve in the disk to form planets. There are two widely held theories for how giant gas planets can form: core accretion and disk instability. Core accretion occurs from the collision and coagulation of solid particles into gradually larger bodies until a massive enough planetary embryo is formed (10-20 Earth masses) to accrete a gaseous envelope. Disk instability, on the other hand, describes the process by which a massive disk rapidly cools, causing it to fragment into planet-sized, self-gravitating clumps. Both theories can be used to define the presence of giant planets, but there are a few pitfalls in these explanations and a plethora of planets that neither theory alone can seem to justify. Let’s look in more detail. The primary accepted mechanism of planet formation is our first theory, core accretion, which is best described in several stages. During the first step, material in the disk collides and aggregates to form small centimetre to metre sized clumps of matter. The clumps then grow further by smashing and sticking together, leading to the gradual coagulation of kilometre-sized planetesimals. Some of these large bodies are massive enough that runaway accretion begins, resulting in the rapid formation of planetary embryos. Here there is a distinction between the formation of terrestrial and gaseous planets. 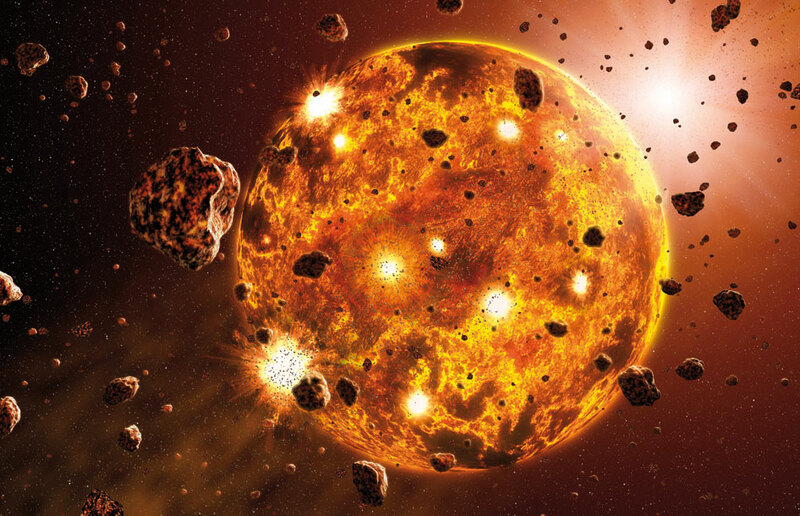 Near the star, heavier metallic elements begin to condense at hotter temperatures and violent collisions and mergers can eventually result in the production of terrestrial planets. The bodies remain relatively small due to the amount of material found in the inner disk, and explains why the terrestrial planets in our solar system lie closest to the Sun. Farther out from the star beyond the snow line, embryos form from a mix of rocky, metallic and also a considerable amount of less dense icy material. At such cool temperatures, hydrogen and helium are able to condense and build to form much larger bodies. Around 10 Earth masses, the planet then possesses enough gravitational attraction to accrete a gaseous atmosphere of hydrogen and helium, a process which continues until all the gas in the planet’s vicinity is exhausted. This describes why the planets in the outer Solar System predominantly consist of lighter elements and are able to acquire such large atmospheres. However, this mechanism struggles to explain massive planets forming at large distances from a star. This has led to HD 106906 b, whose orbit is 650 times greater than the Earth’s orbit around the Sun, to be proposed as forming independently from the star altogether! A problem closer to home is the extremely long time-scale required for Neptune and Uranus to form a core through accretion, which is estimated to be around 10 million years. Since the gas and dust in the protoplanetary disk probably only lasted for a few million years, this poses quite an issue. Newer accretion models may be able to account for their formation within a short enough timescale, but this is still a challenging and ambiguous area. Alternatively, could our ice giants have formed via a different mechanism? A different theory of giant planet formation is via disk instability; a less popular, but still plausible, explanation. This mechanism requires no direct interactions between solids whatsoever, just the condensing of gas and dust in the planetary disk. During the very early stages of a protoplanetary disk’s formation, if rapid cooling occurs in the order of an orbital timescale, material is thought to fragment into bound objects. These fragments would then condense further into the gaseous planets we observe. This theory provides an explanation of planet formation that would occur within a very short (few thousand years) timeframe, and can also be used to explain the presence of large gaseous planets near to or very far from the star. However, whether a disk could cool quickly enough to fragment on an orbital timescale is hotly debated. It could be that it is only a possibility at very large orbital radii. With two competing theories for how the most massive planets form, we still have a lot to learn about the evolution of the different systems we observe, especially our own! It is likely that the formation mechanism is dependent on the system, and that both theories could work within different regimes. But neither of these theories seems to explain the presences of hot Jupiters; gas giants that orbit incredibly close to their host stars with periods of just a few days. It is believed that at such close proximity to the star, temperatures would simply be too high for the planet to retain its gaseous envelope during formation, which is where the idea of planetary migration really came to light. This suggests that perhaps where we observe a planet now isn’t really where it originally formed at all. Check back soon for my next post discussing the different theories of planetary migration.